Clean cauliflower and break into large flowerets. In a large piece of aluminum foil, tightly wrap cauliflower flowerets and peeled garlic cloves that have been seasoned with salt and pepper and place in 350°F oven and bake for 45-55 minutes or until tender. 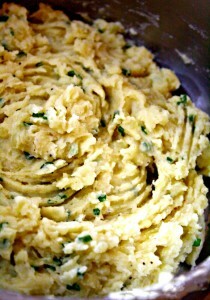 Put into casserole dish and mash to desired consistency (I like a little texture to mine). Add Oil and cream and mix in well. Add the grated Romano cheese and season with salt and pepper as desired. Cauliflower has a lot more moisture in it than does potatoes and then boiling it to death just magnifies the water-logging process. Baking it solves this problem. Can be made ahead and reheated in a 350°F oven until piping hot.